Write, work, and study in a welcoming environment. 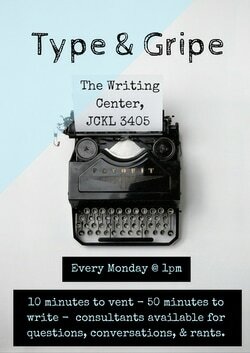 The Writing Center offers one-on-one tutoring with writing consultants. Our consultants will help you identify your strengths and weaknesses as a writer. ​Since our goal is to help you ​become a better writer (rather than making your paper a better paper), your tutorial will involve more than just a tutor editing your paper. Your consultant will ask questions, share writing strategies, and encourage you to talk about your writing. In addition to tutoring, the Writing Center offers a computer lab, study space, and weekly events. For information regarding appointments, visit the appointments page. The Writing Center is a walk-in service - no appointments necessary. You can visit any time, as often as you'd like, at any stage of the writing process. Visit early to make time for revisions. Visit often to get assistance at different stages of the writing process. Bring your assignment sheet so consultants can make sure you are on the right track. Bring questions so your consultant can focus on topics you want to address. Bring your group if you have a group paper. Our policy for group papers is to only look at your specific section(s) unless the entire group is present. Sessions average 20-30 minutes. After 45 minutes, a consultant may end the session and ask you to visit again. Can I drop off my paper? No. During a session you will actively read, discuss, and work on your paper. I'm required to visit the WC, how can I prove I visited? The front desk worker will stamp your paper. However, individual consultants will not sign or fill out any forms, reviews, or documents.